It's been less than two years since The Amazing Spider-Man rebooted the Spidey film franchise, earning over $750 million worldwide and fuelling the next stage of the series. Its mixed reviews primarily targeted the unanswered questions and mediocre villain, but praised its talented cast and visuals. The growth of the franchise is occurring quicker than ever with this inevitable sequel; more villains, more subplots and more characters await. But were they worth waiting for? 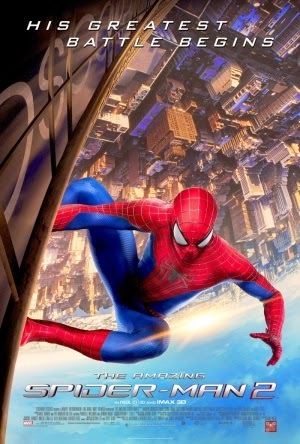 Peter Parker (Andrew Garfield) continues to subdue crime in New York City as Spider-Man, but faces internal struggles with seeing his girlfriend Gwen Stacey (Emma Stone), whom he promised on her father's deathbed he'd avoid. It soon becomes clear that this isn't the only problem he must face; the elusive past of his parents begins to unravel before him as an old friend Harry (Dane DeHaan) and a new foe Electro (Jamie Foxx) appear - and he soon understands that his enemies have more in common than he initially thought. What is immediately apparent when The Amazing Spider-Man 2 begins is that its structure is far superior to that of its predecessor, which felt a bit undercooked in terms of storytelling and exposition. Key plot points felt rushed, the villain was half baked and it seemed too eager to reveal the titular character, sacrificing steady pacing to get to that stage. With this sequel we begin with a beautifully choreographed action scene, packed with all the excitement and humour we've come to expect, and the meat of the narrative unfolds at a comfortable pace as the rest of the film continues. The villain this time round is a lot stronger both before and after his evil transformation, and the inclusion of several more never upsets the flow of the narrative. The talented cast truly shine; Andrew Garfield is further proving himself to be a worthy successor to Maguire, and the chemistry shared between him and Emma Stone is one of the films strongest merits. Newcomers Dane DeHaan, Jamie Foxx and Chris Cooper also portray their characters superbly, and DeHann's performance is perhaps one of the best in the entire film. While it's fair to say the film has its issues in the form of contrivances and a seemingly rushed climax, The Amazing Spider-Man 2 remains a superbly filmed and smoothly directed summer hit. There's signs of a rushed script, but there is actual effort put in here, making it a great watch from beginning to end.